Tesla recent quarterly financial results show progress on several fronts. Over 1,650 customers are now driving the Tesla Roadster, the impressive electric car with a 240-mile range per charge. Customers have driven these 100-percent electric cars more than 11 million miles. Tesla will soon have over 2,000 customers who have paid over $100,000 for their Roadster. 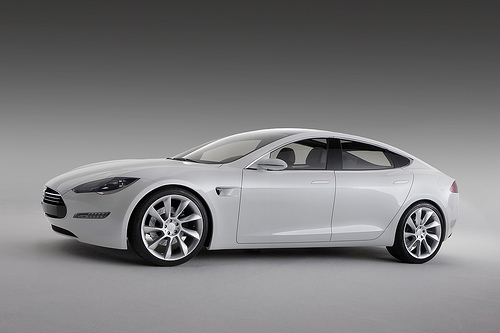 The Model S Sedan is on track for completion and customer deliveries mid-2012. A much bigger market is expected for this premium sedan that starts at $57,400 and has an optional $20,000 battery pack with that gives the car a 300-mile range. When Tesla begins delivery of the Model S, over 50,000 electric car customers will be driving their Nissan LEAF, Chevrolet Volt, Ford Focus Electric and other electric sedan competitors. Tesla will compete against these less expensive competitors with a luxury interior, electronics like a 17-inch display, 7 passenger capacity, switchable battery, and options to triple the electric range of competitors. A new generation of lithium batteries is at the heart of the vehicles range of 160 miles with optional packs that provide 230 and 300 miles of range per electric charge. 4,600 customers have already placed reservations for the Model S with a starting price of $57,400. Tesla is also making significant progress as a battery and electric drive system provider. Tesla delivered a record number of production battery packs and chargers for both Daimler’s Smart fortwo and A-Class vehicles for the fourth quarter in a row. Daimler increased its total orders for the Smart fortwo electric drive components from 1,800 to 2,100 sets. All of these will be delivered in 2011. Daimler owns 5 percent of Tesla. Meeting product deadlines will depend on staying on-track in opening its new factory in Fremont, California – The Tesla Factory. Intensive site preparations are underway at each of the stamping, plastics, and paint shops as the facility is being prepared for the upcoming Model S beta build. Equipment testing in carefully controlled manual modes of operation has begun in both stamping and plastics shops, with robots and other automation equipment scheduled for installation later this year. Installation of the hydraulic press line remains on schedule for manual operation in the second quarter. Tesla Motors (Nasdaq: TSLA) announced its preliminary unaudited financial results for the quarter ended March 31, 2011. Revenues for the first quarter of 2011 were $49.0 million, a 35% increase from the $36.3 million reported in the prior quarter. Gross margin improved to 37%, up from 31% for the prior quarter. Net loss for the quarter was $48.9 million as compared to $51.4 million in the prior quarter on a GAAP basis. Like its Roadster, Tesla has been growing the company at zero to 60 in four seconds. Revenues are strong, but profitability is not in sight as the company invests for high growth and big plans for the Model S and Model X. It would be interesting to see whether any of the owners chose to install a solar charger for their vehicle. Would it be difficult to find out? It would be good to see if there were any significant problems to overcome when using pure solar. Where is the “Volkswagon” of the electric car!! Something an average American can afford. Something that can be purchased within the state of our current economy.